Create the players’ home community with community creation rules or hit the road and see what awaits you. 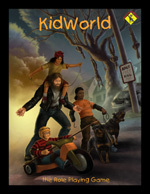 For more information on the game, see KidWorld In Brief (also available in Hebrew , Swedish , German and French ). Have the book? Get the PDF here free. *Anyone who has purchased a printed copy of the book from any source can download a pdf copy here. Art by Michaël Brack, Nicole Cardiff, Anthony Carpenter, Liz Clarke, Ed Cox, Pablo Palomeque, Adam Hunter Peck, Tyler Windham, Claire Buhler.